This week we’ll be looking at the convergence of two of the Keyboard Company’s specialities: mechanical switches and ergonomic keyboards, in the Truly Ergonomic. The layout is quite different than other keyboards, with QWERTY as the baseline but the modifiers and special keys moved into different positions. For example, the most commonly used keys like Enter, Backspace, Tab and Delete are in a row in the centre. Modifiers are also in a new position, with shift sitting comfortably in the ASDF row and Control and Alt below it. The number pad is mapped onto keys on the right hand side, allowing the Truly Ergonomic to be less wide than a standard keyboard. By not being bound to convention, the Truly Ergonomic is able to provide an even more comfortable typing experience. 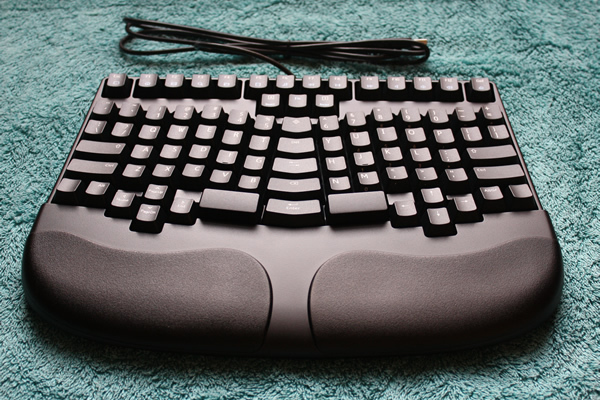 This unique ergonomic keyboard also includes real mechanical switches – Cherry MX Browns, in fact. These popular switches provide a good mixture of tactile feedback and light weighting, while not providing the same potentially disruptive click that can be associated with a Blue switch. There are other ergonomic touches as well, including a palm rest (which can be removed). There are also dip switches on the rear of the keyboard, allowing the customisation of a great deal of settings – five in all. You can change the function of certain modifiers, as well as allow the keyboard to be freely programmed. So, how does it work out? Well, I took a few days to give it a shot. The first hour or so was pretty difficult, I’ve got to admit! There are really quite a few changes here; while the letter keys are fairly easy to get used to, the positioning of backspace and enter took a little bit longer. However, about two hours in everything clicked. While I didn’t manage to attain the same level of speed and proficiency that I’d be able to achieve with a standard layout, I crept up to a comfortable 40 words per minute. It’s really nice to have an ergonomic keyboard without needing to go back to rubber domes. The keyboard’s small size is also quite unusual in the ergonomic arena – most ergonomic keyboards like the Microsoft example mentioned above are considerably wider than standard keyboards, which promotes a less healthy widened mouse stance. All in all, if you’re having problems with carpal tunnel or just want to experience a more comfortable typing platform, then the Truly Ergonomic is definitely a worthwhile investment. While changing your posture and performing regular exercise and stretches will help, a truly ergonomic keyboard might be just what the doctor ordered. We’ll add the Truly Ergonomic to our website soon, in two flavours – the 209, which is the model I reviewed, and the 207, which includes a double size Alt key instead of a split Alt and Blank keys. The Keyboard Company will be distributing the keyboards in Europe, to sit alongside our other exclusive mechanical keyboards from Filco and Matias. Update: We have now added five TECK models to our website, and all are in stock and ready to ship today. Click here to see the selection available. 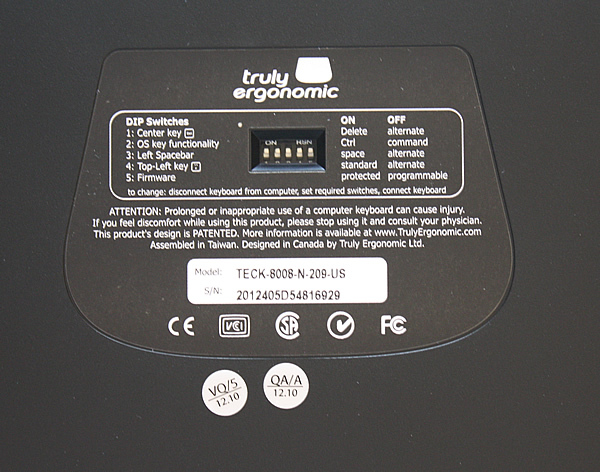 For more Ergonomic keyboards, check out the Ergonomic (natural) devices section of our site. ‹ Filco Mechanical Keyboard Giveaway ends tonight at 10pm GMT! How about some comments on how poor the company is? They lied repeatedly to their customers on a release date (after taking money). They lied about it being programmable and they lied about programming software. I wouldn’t touch them with a bargepole! I really love this keyboard! Finally someone stepped off the ancient keyboard layout that was invented to keep typewriters working. I’m gonna try to program mine as a CODE or DOVORAK keyboard, but even if that turns out to be impossible I’m very happy with my keyboard. How do you know they lied about those things? Them thinking something is possible but it later turning out to not be possible with quality is not the same as lying. I’d rather have a keyboard with perfect quality (that I’ve had so far) than extra features like programmability and I’m willing to wait for it, this keyboard will last me 10 years! Wow, that is a strong post. I am confident that you are NOT talking about The Keyboard Company. I think you must be referring to the ‘kickstarter’ process that was used to produce the first batch of Truly Ergonomic Keyboards. We were not involved at that point so I really cannot make meaningful comment, but I understand from watching Geekhack that it was not a particularly smooth process and some people wondered if they would get their keyboard, or their money back. And that communication was not of the highest order. All I would say is that this happened when TE was a start up and that all the dealings we have had with them have been very straight forward. I trust that everyone did receive their keyboards or refund. Sometimes we need to do something unusual in order to achieve something great and the truth is, these guys in Canada with almost zero resources, before kickstarter was heard of did manage to design, tool and manufacture an Ergonomic Keyboard better than all the established computer manufacturers and so called ergonomic specialists had ever managed. It should have a place in the market for many years and thousands, maybe millions of people will benefit from using it. I certainly hope so being as we are a reseller! I do understand what you mean, and your anger, I guess you were one of those who invested in the initial batch. If you were I congratulate and thank you for helping make something good happen. I do feel that the greater good has been served. Remember when Geekhack was all about the lack of decent keyboards? People posted about how to find old ones in skips (Dumpsters), and how to locate the few business’ that would/could supply and support properly produced keyboards. You all helped change that and I salute you. Even though they have a 60 day guarantee return policy, their returns staff is slow and will take weeks to respond. They will also try to get you to change the layout of your keyboard. This is a time consuming return process and the customer service is very slow. I am still sitting on mine and I am unable to get anyone to respond to me. I am now well past the return window. This was essentially a waste of $250. Damn – I’m really sorry to hear that you’ve had such a bad experience. With regard to the returns staff, were these employees of KeyboardCo, Amazon, or Truly Ergonomic, the makers of the keyboard? Regardless, I’ll try to get this sorted out for you if I can! Thanks Will, turns out that the problem I had was with the service department of “Truly Ergonomic” and not “The Keyboard Company”! Thanks for clarifying this for me. I purchased directly from Truly Ergonomics and although I LOVE my keyboard, when one of the key’s mount plastic cracked, I was unable to get a response for a fix. If you do purchase this keyboard, get it through a reputable dealer, NOT Truly Ergonomics. I wish I would read more reviews (keywords “Truly Ergo Keyboard bad”) before I purchased my TECK. I have had two months of double key presses or key presses that do not result in any output of a character. I find the “break-in period” total BS because I’ve used other mechanical keyboards before and not had any issues. I’ve been using the TECK for over two months heavily (I’m a programmer) and I get random issues on even the most used keys. For instance the letter “L”, would take two to three key presses to emit a keycode. Sometimes the “.” wouldn’t work when in Numpad mode (makes anything math related worthless). Right now they (i.e. TECK themselves since this was a direct purhcase) have agreed to let me RMA it even though I’m past the 60 days — mostly because I’ve been dealing with email tech support for over a month to no avail to a resolution. I cannot even count the number of times they have asked me to flash the firmware. I’m like really? Do you think flashing it with the stock firmware for the 20th time is going to magically make it work? Also, please unplug and exercise the offending keys 10-30 times to help break them in is not a solution either. So now its been four days since they agreed to the RMA and I submitted the request, but no response. So if I hear nothing, they can deal with American Express which I know will immediately refund my money. Letters L and O, the dot, the slash, several numbers, page up… the list goes on. Really bad company. Such a shame, since I really love the form-factor. I’m sorry to hear of the troubles you’ve had with the keyboard Moshev — it definitely sounds faulty. If you bought it from us, then have you gotten in touch with our support staff? 1 Pings/Trackbacks for "Truly Ergonomic Keyboard Impressions"